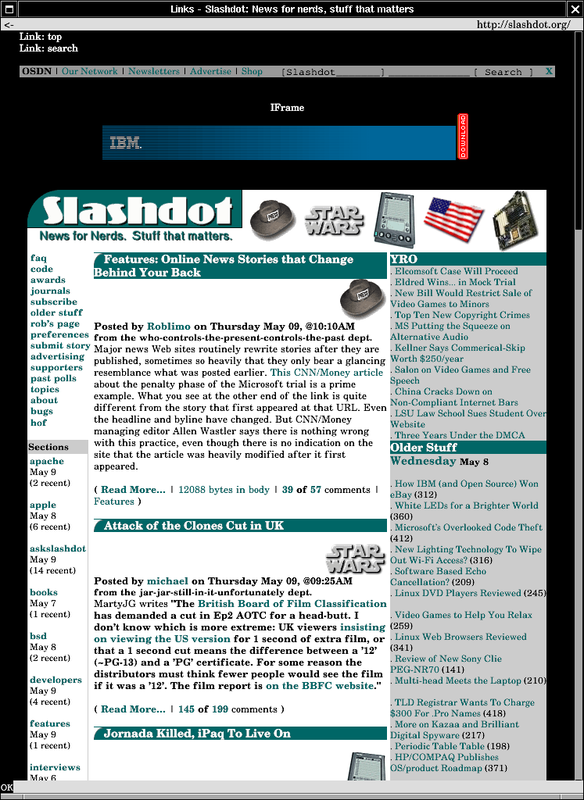 Links is a graphics and text mode web browser, released under GPL. Links is a free software. Links runs on Linux, BSD, UNIX in general, OS/2, Cygwin under Windows, AtheOS, BeOS, FreeMint. 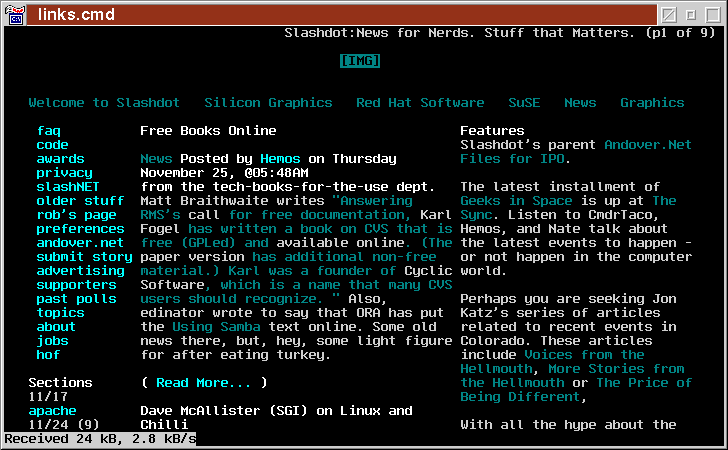 Links runs in text mode (mouse optional) on UN*X console, ssh/telnet virtual terminal, vt100 terminal, xterm, and virtually any other text terminal. Mouse is supported for GPM, xterm, and OS/2. Links supports colors on terminal. Easy and quick user control via pull-down menu in both text and graphics mode, in 25 languages. Possibility to hook up external programs for all MIME types, possibility to choose one of more programs at every opening. 48-bit high-quality image gamma correction, resampling and Floyd-Steinberg dithering in all color depths. Font resampling (antialiasing) for virtually unlimited pitch range, LCD optimization of fonts and images. User-adjustable menu, HTML font size and image zoom factor. Automatic aspect ratio correction for modes like 640×200, 640×400, 320×200 with user-adjustable manual aspect ratio correction. Support for one-wheel mice (vertical scroll), two-wheel mice (vertical and horizontal scroll) and smooth scrolling by grabbing the plane with a mouse (no wheel needed). Easy installation, the browser is just one executable and no more files. For more screenshots and info visit its official site.